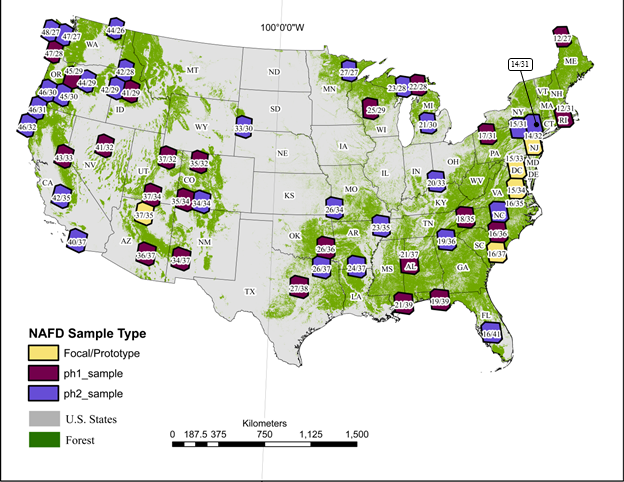 This data set provides the results of time-series analyses of Landsat imagery for 55 selected forested sites across the conterminous U.S.A. The output is a pair of disturbance data products for each site, one showing the first year of disturbance in the time series, the other showing the last year of disturbance. Each data pixel is labeled as either a static land class (persistent non-forest, persistent forest, or persistent water) or with the year of change for disturbed forest pixels. The time period analyzed is approximately 1984-2009. These forest disturbance data are distributed as a single band GeoTiff, with appropriate projection information defined within the file. The analyses were performed in three phases: 5 sites during the Prototype/Focal phase; 23 sites in Phase I; and 27 sites in Phase II. The spatial resolution of the Prototype/Focal and Phase I data is 28.5 meters. The spatial resolution of the Phase II data is 30 meters. The temporal resolution is nominally biennial. The mapped area for each forested site is approximately 185 km x 185 km. There are a total of 110 GeoTiff files – a first year and a last year of disturbance file for each of the 55 sites. Within the framework of the North American Carbon Program (NACP), the North American Forest Dynamics (NAFD) project has evaluated forest disturbance and regrowth history for the conterminous U.S. by combining Landsat observations and field measurements (Goward et al. 2008). The NAFD project uses the Vegetation Change Tracker (VCT), an automated forest change analysis algorithm, on temporally dense (annual or biennial) Landsat Time Series Stack (LTSS) of images and produces forest disturbance data products (Huang et al. 2010). The VCT algorithm was designed specifically for mapping forest change using LTSS. The algorithm consists of two major steps: 1) individual image analysis and 2) time series analysis. 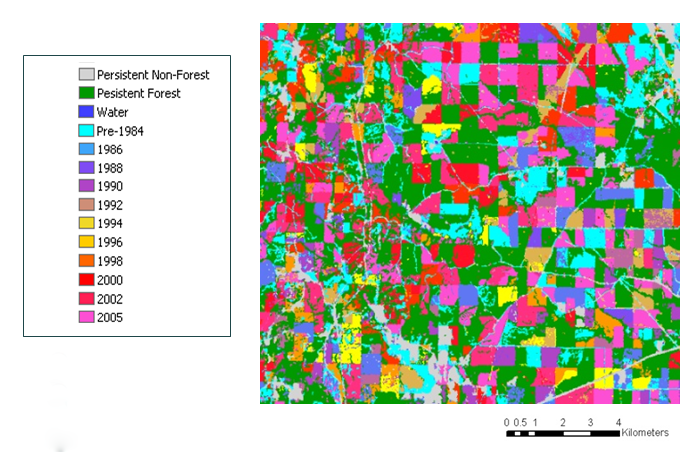 VCT produces a disturbance product where each pixel is labeled as either a static land class (persistent non-forest, persistent forest, or persistent water) or with the year of change for disturbed forest pixels. Figure 1: The first year of forest disturbance map for an area in Mississippi ( p21r37 ) where industrial forestry is prevalent. The legend details the map classification system. The first three map categories are static classes which are consistent throughout the time series: persistent non-forest, persistent forest, and water. Forest change pixels are classified according to the year in which change occurred. Actual disturbance year classes vary according to the image dates present in each individual LTSS. The NAFD (North American Forest Dynamics) study, a core project of the North American Carbon Program (NACP), is pursued with grant support from the NASA Terrestrial Ecosystems Program and the NASA Applied Sciences Program. High-level preprocessing of the Landsat images using LEDAPS was performed by Teng-Kui Lim of Science Systems and Applications, Inc. (SSAI). Goward, S. N., J. G. Masek, W. Cohen, G. Moisen, G. J. Collatz, S. Healey, R. Houghton, C. Huang, R. Kennedy, B. Law, S. Powell, D. Turner, and M. A. Wulder (2008) Forest disturbance and North American carbon flux. Eos Transactions, 89, 105-116. This NAFD data set provides forest disturbance data produced using the VCT algorithm for 55 selected sites, Landsat Time Series Stacks (LTSS) were assembled for each site location (Huang et al. 2009a). Two maps are available for each site, one showing the first year of disturbance in the time series, the other showing the year of the last disturbance. The disturbance data are in GeoTIFF format in Universal Transverse Mercator (UTM), WGS-84 projection, and 28.5-meter resolution (Prototype/Focal and Phase I) and 30 meter resolution (Phase II). The mapped area of each site is approximately 185 km x 185 km. Sites:NAFD Prototype/Focal, Phase I, and Phase II sample sites over the USFS forest cover type map. Figure 2. This map shows the location of the Eastern and Western sample sites for which LTSS were assembled. For clearer representation, the sample locations are shown using non-overlapping Thiessen polygon boundaries. The map products for each location cover roughly 185 km2. Site locations are shown over top the Forest Inventory and Analysis (FIA), U.S. Forest Service, forest mask (Ruefenacht et al. 2008). Site locations were derived from a probabilistic sampling scheme designed to estimate national levels of forest disturbance in an eastern and western stratum (Kennedy et al. 2006). Site names and coordinates are included in Table 1. The Landsat Spectral Reflectance (SR) images are approximately 185 km x 185 km. The spatial resolution of the scenes is 28.5 meters for Prototype/Focal and Phase I, and 30 meters for Phase II. The Landsat SR images used in the analyses cover the period from 1984-2009; though vary some with specific location and availability of low cloud cover Landsat data. The selected years of images used for each site analysis are included in Table 1. Biennial (or more frequent) retrieval of Landsat images. These forest disturbance maps are distributed as a single band GeoTiff, with appropriate projection information defined within the file. The disturbance data are stored as 8-bit unsigned integer GeoTiffs. The *_disturbYear_flt_v1_first.tif data files show the year when the first recorded disturbance occurred. The *_disturbYear_flt_v1_last.tif data files show the year when the last recorded disturbance occurred. If only one disturbance occurred during the observing period, the two layers will have the same value. The persistent land cover classes will have the same values in each of these layers. Data values greater than 10 (data pixel value + 1970) indicates year of forest disturbance Year of forest disturbance is the data value plus 1970. For example, disturbance class 33 was disturbed in 2003. The first disturbance year in each time series (usually disturbance classes 14 or 15) can best be described as “pre-series disturbance”, as these are pixels that are not forested in the beginning of the time series, but are forested by the end of the series. The date of disturbance is not known, because these are events that occurred prior to the start of the time series. This class should be dealt with in any analysis differently than the subsequent disturbance years. The following table lists the site names, the names of disturbance data files distributed in the data set in GeoTiff format, the dates of the Landsat SR images used in the time-series analyses, the projections of the Landsat SR images and the disturbance GeoTiffs, and the data file coordinates (upper left and lower right). The combination of Site Name (Landsat image path and row) and date will lead a user to the unique Landsat image used in these analyses. Table 1. Site name and disturbance data GeoTiff file descriptions. Latitude and longitude are in decimal degrees. Moderate resolution (Landsat type) satellite data provide the only means of constructing spatially-explicit, temporally-detailed disturbance records. The Landsat record provides a unique opportunity for understanding forest disturbance history over the last three decades. The work relies on the use of annual or biennial time series of Landsat time series stacks (LTSS), which may be analyzed at fine spatial scales (~60 m to 100 m), using time series methodologies and validation. The NAFD project uses roughly one Landsat image every year or every two years from 1984 to 2009 for 55 locations across the conterminous US. The primary science goal of the North American Forest Dynamics (NAFD) research is to develop a sound understanding of North American forest disturbance and regrowth during the Landsat era to improve knowledge of the North American Carbon cycle. NAFD developed a method of map validation that uses visual analysis of the Landsat time series along with at least one date of high-resolution aerial photography. This methodology was applied to 6 sites from Phase I and 6 from Phase II. Design-based accuracy assessment of the disturbance year products revealed that overall accuracies of around 80% were achieved for disturbances mapped at individual year level. Accuracy assessments by forest product users and producers of the disturbance classes averaged around 70% and 60% for 5 of the 6 validation sites, respectively, suggesting that although forest disturbances were typically rare as compared with no-change classes, on average the VCT was able to detect more than half of those disturbances with relatively low levels of false positives. For more in-depth discussion of validation see Thomas et al. (2011). The North American Forest Dynamics (NAFD) project was designed to improve understanding of the carbon budget for North America (Goward et al. 2008). One of the many goals of this project was to evaluate forest disturbance and regrowth history over the last 20+ years for the conterminous U.S. using dense Landsat observations. The project was initiated with a prototype study using only a few locations to test the feasibility of compiling and analyzing time series of Landsat images in conjunction with FIA data. In 2005 NAFD Phase I was funded. To keep the data cost under control, national estimates of disturbance rates in Phase I were derived using 23 sample sites selected across the conterminous U.S. (Kennedy et al. 2006). Another 27 sample sites were added for phase II using the same sampling methodology to reduce uncertainty in the national estimates. Defined by a path/row tile of the World Reference System (WRS) (Irish 2000), each sample site had an area of approximately 185 km by 185 km. For each selected site, a Landsat time series stack (LTSS) was developed and the VCT algorithm was used to evaluate forest disturbance history. A Landsat time series stack (LTSS) refers to a sequence of Landsat images acquired at a nominal temporal interval for a particular WRS path/row tile (Huang et al. 2009a). A LTSS typically consisted of one image approximately every two years. Selected image dates were constrained to dates during the peak green foliage period, which is typically between early June and mid-September for the midlatitudes, and low cloud cover when possible. Most selected images were purchased from the USGS National Center for EROS. The images were processed with high-level preprocessing algorithms, including updated radiometric calibration for Landsat 5 images, atmospheric adjustment to surface reflectance, precision registration and orthorectification, in the Landsat Ecosystem Disturbance Adaptive Processing System (LEDAPS) (Masek et al. 2006). The radiometric consistency of the images in a LTSS was quantitatively assessed by evaluating the variability thru time of stable targets. The Vegetation Change Tracker (VCT) is an automated forest change analysis algorithm. The VCT runs on temporally dense (annual or biennial) Landsat Time Series Stack (LTSS) of images and produces forest disturbance map products. Huang et al. (2010) describe the VCT algorithm in detail. See Figure 3. Figure 3: The VCT algorithm uses the spectral-temporal properties of Landsat Time Series Stacks to produce forest disturbance products (from Huang et al.(2010). This algorithm is based on the spectral–temporal properties of forest, disturbance, and post-disturbance recovery processes. VCT first analyzes each individual image to create masks and spectral indices that measure forest likelihood. It then simultaneously analyzes all images within an LTSS to detect disturbances and uses the spectral trajectory following each disturbance to track post-disturbance processes. Huang, C., S. N. Goward, J. G. Masek, F. Gao, E. F. Vermote, N. Thomas, K. Schleeweis, R. E. Kennedy, Z. Zhu, J. C. Eidenshink & J. R. G. Townshend (2009a) Development of Time Series Stacks of Landsat Images for Reconstructing Forest Disturbance History. International Journal of Digital Earth, 195-218. Huang, C., S. N. Goward, J. G. Masek, N. Thomas, Z. Zhu & J. E. Vogelmann (2010) An automated approach for reconstructing recent forest disturbance history using dense Landsat time series stacks. Remote Sensing of Environment. Irish, R. R. 2000. Landsat 7 science data user's handbook, Report 430-15-01-003-0 National Aeruonautics and Space Administration. National Aeruonautics and Space Administration. Kennedy, R. E., W. B. Cohen, G. G. Moisen, S. N. Goward, M. Wulder, S. L. Powell, J. G. Masek, C. Huang & S. P. Healey. 2006. A Sample Design for Landsat-based Estimation of National Trends in Forest Disturbance and Regrowth. In NASA Joint Workship on Biodiversity, Terrestrial Ecology and Related Applied Sciences. College Park, MD. Masek, J. G., E. F. Vermote, N. E. Saleous, R. Wolfe, F. G. Hall, K. F. Huemmrich, F. Goa, J. Kutler & T. Lim (2006) A Landsat Surface Reflectance Dataset for North America, 1990–2000. IEEE Geoscience and Remote Sensing Letters, 3, 68-72. Ruefenacht, B., M. V. Finco, M. D. Nelson, R. Czaplewski, E. H. Helmer, J. A. Blackard, G. R. Holden, A. J. Lister, D. Salajanu & K. Weyermann (2008) Conterminous US and Alaska Forest Type Mapping Using Forest Inventory and Analysis Data. Photogrammetric Engineering and Remote Sensing, 74, 1379-1388. Thomas, N. E., C. Huang, S. N. Goward, S. Powell, K. Rishmawi, K. Schleeweis & A. Hinds (2011) Validation of North American Forest Disturbance dynamics derived from Landsat time series stacks. Remote Sensing of Environment, 115, 19-32.